Kyle Grillot - kgrillot@shawmedia.com Valedictorian Jacqueline LeJeune reads over her speech in an upstairs classroom before the Alden-Hebron High School commencement ceremony Sunday, May 18, 2014 in Hebron. Kyle Grillot - kgrillot@shawmedia.com Haileigh Mogan and Jorge Carbajal walk towards the gym before the Alden-Hebron High School commencement ceremony Sunday, May 18, 2014 in Hebron. Kyle Grillot - kgrillot@shawmedia.com Salutatorian Gabrialla Peterson stands to be recognized during the Alden-Hebron High School commencement ceremony Sunday, May 18, 2014 in Hebron. Kyle Grillot - kgrillot@shawmedia.com Seniors walk towards the gym for the Alden-Hebron High School commencement ceremony Sunday, May 18, 2014 in Hebron. Kyle Grillot - kgrillot@shawmedia.com Seniors including Alfredo Lopez-Leon, (from left) Jaqueline Walters, Brooklyn Hilton, and Gabriella Peterson walk towards the gym for the Alden-Hebron High School commencement ceremony Sunday, May 18, 2014 in Hebron. 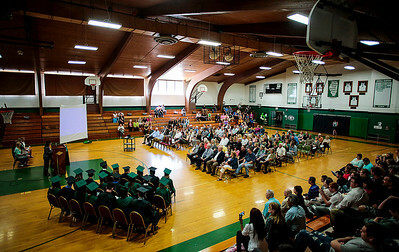 Kyle Grillot - kgrillot@shawmedia.com The Alden-Hebron High School commencement ceremony Sunday, May 18, 2014 in Hebron. 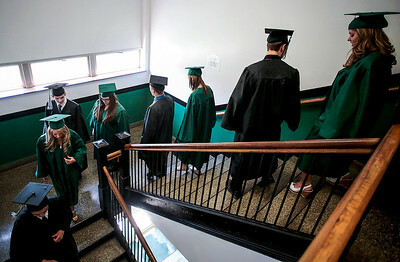 Kyle Grillot - kgrillot@shawmedia.com Senior gather in a hallway before walking towards the gym for the Alden-Hebron High School commencement ceremony Sunday, May 18, 2014 in Hebron. 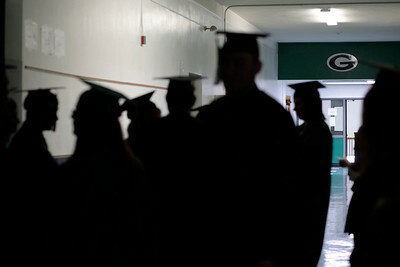 Kyle Grillot - kgrillot@shawmedia.com Seniors wait to enter the gym for the Alden-Hebron High School commencement ceremony Sunday, May 18, 2014 in Hebron. Kyle Grillot - kgrillot@shawmedia.com Seniors including Randy Suchowski, (from left) Jorge Carbajal, Amanda Hack, and Alfredo Lopez-Leon gather in a classroom before the Alden-Hebron High School commencement ceremony Sunday, May 18, 2014 in Hebron. 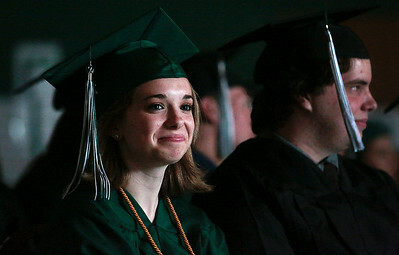 Kyle Grillot - kgrillot@shawmedia.com Valedictorian Jacqueline LeJeune looks out into the crowd during the Alden-Hebron High School commencement ceremony Sunday, May 18, 2014 in Hebron. 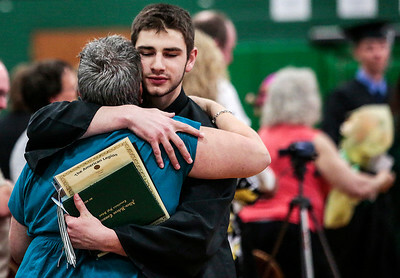 Kyle Grillot - kgrillot@shawmedia.com Avi Mor Hugs his mother Kathy Mor after the conclusion of the Alden-Hebron High School commencement ceremony Sunday, May 18, 2014 in Hebron. 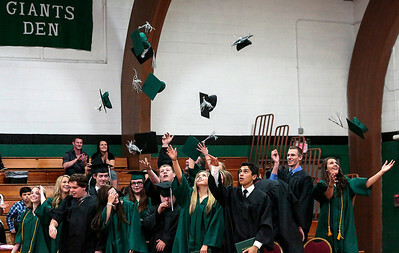 Kyle Grillot - kgrillot@shawmedia.com The class of 2014 throws their caps after the conclusion of the Alden-Hebron High School commencement ceremony Sunday, May 18, 2014 in Hebron. Kyle Grillot - kgrillot@shawmedia.com Seniors including Amanda Hack (left), and William Stephan wait for all students to enter the gym for the Alden-Hebron High School commencement ceremony Sunday, May 18, 2014 in Hebron. Kyle Grillot - kgrillot@shawmedia.com The class of 2014 release balloons outside after the conclusion of the Alden-Hebron High School commencement ceremony Sunday, May 18, 2014 in Hebron. 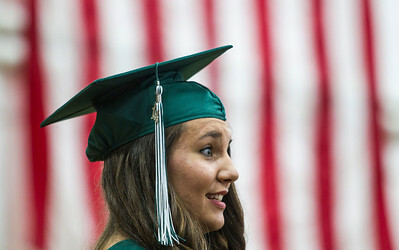 Valedictorian Jacqueline LeJeune reads over her speech in an upstairs classroom before the Alden-Hebron High School commencement ceremony Sunday, May 18, 2014 in Hebron.